Getting a loft bed is an excellent idea for cramped bedrooms. By elevating the bed, you’ll maximise space and install the study table underneath the sleeping area. This is, in particular, relevant for kids whose homework schedule is changing and they are entering a stage where they need to study for exams and spend longer doing their homework. This change will come with the need for more storage. Kids will have more books and a lot more stationery to store. Their interests might also expand, and they may need more room to create space for hobbies. To store all of their extra books and papers we’ve got loft beds with desks and drawers. When kids start to enter their teenage years, they will want to have their friends over to listen to music, play video games and hang out when it’s raining outside. Having a high sleeper bed create lots more floor room to put a couch which is great for sleepovers and overnight guests. Safety is one of the most common concerns for parents. We can promise the bed to be sturdy as long as there is no jumping on the foundations that will cause the loosening of the construction of the bed. Lastly, position a rug underneath the bed if you have a hard floor. It is one of the safety features in case of an accident. 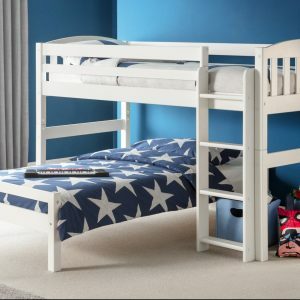 We offer loft beds for kids who are both in primary schools and who have already transitioned into more serious studying. 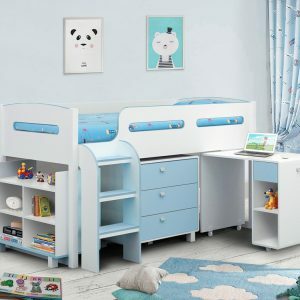 Loft beds are different to bunk beds and instead of creating more sleeping areas they maximise floor space for studying or playroom. The primary focus here is to have a child store away their belongings and depending on the age either study or do more creative activities such as arts and crafts. You can see that our ‘Kimbo Pink’ and ‘Kimbo Blue’ study beds both for girls and boys have pull-out desks. It is a convenient feature for rooms that have limited space as you can simply push it in whenever you’re not using the desk. This frees up even more space and makes the room more spacious for other activities. "The study design bunk bed with a desk utilizes the standard loft platform to place – instead of a lower bed – a desk or work station below the upper level." - Description of the Study bed from Home Stratosphere. When it comes to studying it is important to remember that when you’re installing your loft bed include power outlets so that a child can plug in their electronics and lights. Storage and a comfortable chair are essential. Add storage to put away items that aren’t needed while studying so a child can stay focused on one task. Plenty of ambient and electrical lighting is vital to stop the eyes from getting tired too quickly. Ask your child if they find themselves squinting, it means that they may need to add more light into their workspace. Bold colours are stimulating and energising. They also add a little bit of personality into the workspace. Try adding some wall art or wallpaper behind the study bunk bed for a stylish and cosy effect. There are many other ways of creating productive study spaces for your children. Keeping these three simple solutions in mind will help your child achieve their study goals easier. Loft beds will be the perfect solution when it comes to creating an allocated study area. It helps if the room has a breathing space with everything easily accessible. 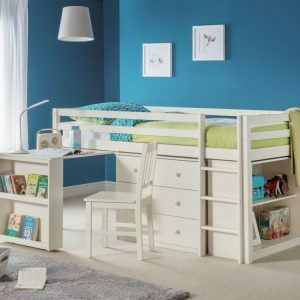 If you’re still stressing out and thinking about giving your child a peaceful opportunity to succeed with their school work, loft beds will be one of the most effective and fastest solutions on the market.